Playing the role of Scoop Sanderson, Main Street, U.S.A. Gazette reporter, Mickey Mouse gets the "scoop" in this unique, pin-of-the month collection. In each limited edition pin, Mickey will reveal fun facts or interesting tidbits about classic Disney attractions. 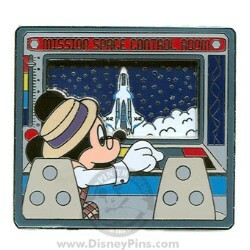 In this limited edition pin, Mickey reports from the Mission: SPACE control room at Epcot. The pin is mounted on a backer card that resembles The Main Street Gazette newspaper. The back of the card contains the rest of the story. This pin contains a pin-on-pin element. Chris Chapman from Disney Design Group created the artwork for this pin. Disney Frozen Pin - Elsa & Olaf - "Let It Glow"